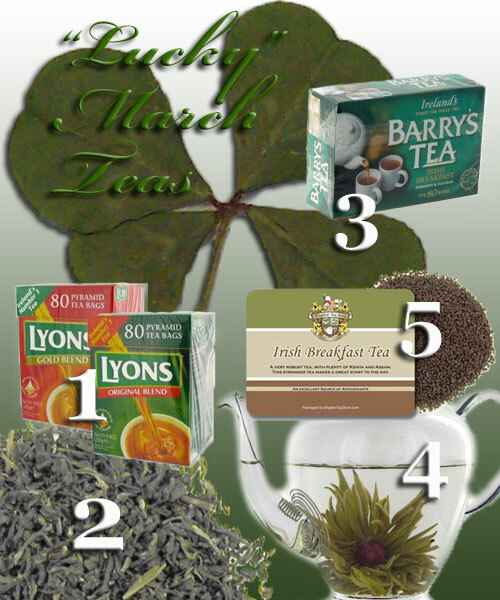 5 “Lucky” March Teas Not to Miss! One of Ireland’s biggest brands, Lyon’s Tea is made in Dublin, Ireland. It is bagged in pyramid style bags, so there is more room for the tea inside to infuse into the hot water. That assures a truer taste in the cup. Original Blend Lyon’s Tea was formally called Lyon’s Green; today, it is one of the most popular teas in Ireland. Make this tasty beverage a part of your morning routine, you will be glad you did. Lyon’s Gold Tea is another one of Ireland’s best known and loved brands and is an expert blend of the finest Assam, Ceylon, and Kenyan teas for a full-bodied all around flavor that you are sure to enjoy. When it comes to Darjeeling teas, we don’t always think of green tea. For that, we usually think China or Japan. But green tea is just where the tea leaves are not allowed to oxidize (some call it fermenting). This tea is a second flush Darjeeling grown at 3,000 to 4,600 feet elevation where the leaves have been steamed to halt oxidation. The signature muscatel taste is still there, though, making this green tea quite different from those green teas from China and Japan. Hubby and I tried this tea for the first time about a year-and-a-half ago and gave our impressions here. While my favorite is their Gold Blend, the Barry’s version of the classic Irish Breakfast tea blend is a great option, a bit smoother and milder but still not wimpy. Teas from the high-mountain slopes of Kenya and the Assam Valley of India are skillfully blended by tea masters to assure they steep up a cuppa with pungency, strength, and a rich flavor that stands up to milk and sweetener. It’s great any time of day, delivering a robust pick-me-up just when you need it. Flowering teas are all hand-crafted. Tea leaves are carefully selected for their full, intact, just picked shape. They are hand-sewn together using thick cotton thread and then combined with a flower bud that is not open. This one is made of a high-quality green tea and amaranth blossoms. The cup delivers a subtle floral character, lightly toasty grassiness, and a hint of caramel. Legend says that this combination was inspired by a monkey story, where the Monkey King ate the best peaches from the orchard of the Empress of Heaven instead of guarding and preserving them. He was stripped of his title, locked in a cave, and then rescued by Tangshen, a monk. He showed the monkey how to use the green tea leaves and amaranth blossom to make a peach-shaped bloom. You didn’t think I’d forget this one, did you? The Leprechauns would have pulled no end of tricks on me otherwise. This is The English Tea Store’s own version of Irish Breakfast Tea, made from a stout robust blend of February Kenya BP1 and 2nd flush Assam teas. It steeps up a liquid that has a superb color and very full-bodied taste that gets even better with the milk and sweetener which are traditional in Ireland. Hope you get to try some of these during March to help you get through the rest of Winter and also treat your “special someone.” Enjoy!